This network switch is designed for gaming. But does it make a difference? For wired gaming devotees in need of a switch for more Ethernet ports and QoS, the Nighthawk S8000 is worthy of consideration. A switch is an essential part of networking gear that provides additional Ethernet ports. Traditionally, most routers have an integrated switch with at least four ports right in the device, which is adequate for smaller setups, although many mesh router kits have a minimal number of these ports. For users that have multiple devices to plug in, a switch is a simple way to build out their wired network. When choosing a switch, we generally look for the number of available ports, and prefer Gigabit speeds (or faster, although 10 Gbps is not really found in the consumer market). When Netgear announced the Nighthawk S8000 switch, which promised advanced gaming and streaming capability, as well as an 8-port Gigabit Ethernet switch, quite frankly on first glance it looked like a solution to a problem that did not exist. We went back and forth if we even wanted to review this product, as we felt that QoS should be at the level of the router, which ultimately controls the network, and it made little sense initially to have QoS at the switch. After all, once a packet gets tagged for top priority, what difference does it make if it gets retagged downstream? Still, we were intrigued enough to give the Netgear S8000 a once over, if for no other reason than to save our loyal readers from being swindled into buying what might be networking snake oil. The Netgear S8000 itself has the appearance of other Nighthawk series products, which are targeted towards the gaming community. However, it is smaller than most routers and constructed of metal, giving it a solid presence. It also has integrated blue LED’s on the front and back. Setting it up involved no software installation. Rather, it is a web based setup similar to what many routers use these days. However, as a router needs to hand out an address to the switch—and this is a dynamic process—you need to go into Windows Explorer and find the IP address of the Nighthawk S8000, which is seen above as 192.168.1.9, and enter this into the browser in order to access the switch’s settings. It's not terribly difficult, but the process may put off truly novice users who want something a bit more "plug and play." This default configuration leaves ports 3 through 7 unassigned to any priority. The idea is to simply plug the gaming machine into port 1, and the connection to the router into 8, and things are ready to go. This is known as the Gaming Preset. There are also two other presets. The first preset is the Media Streaming Preset that prioritizes port 2 for media devices to prioritize download streaming. The Standard Preset just makes all the ports equal priority. The Nighthawk S8000 also supports link aggregation. This is a technology to couple together Ethernet ports to provide additional bandwidth up to 4 Gbps. The implementation here is flexible, with the ability to aggregate up to four ports simultaneously to provide additional bandwidth. Ever wonder if an Ethernet cable has gone bad? We certainly have, and while there are Ethernet cable testers out there, few home users have this type of equipment. Truth be told, our usual solution is to toss the cable in question, and just use a different one to eliminate the possibility of the issue. The Nighthawk S8000 has the nifty feature that after specifying the port, a test of the cable can be performed to determine if the cable can be used or should be given a one way ticket to the trash bin. The idea of a switch having an Easter Egg was a bit of surprise. It left us initially wondering what “Cylon Mode” was, but fans of Battlestar Galactica will definitely appreciate this feature. Features and gimmicks aside, the ultimate question is did the Netgear Nighthawk S8000 distinguish itself as a gaming switch, or really do anything beyond what the umpteen other switches on the market already do. After all, the market is saturated with plenty of more generic 8-port switches for under $50. At the end of the day, how the Nighthawk S8000 switch performs really comes down to your router. We tested first using the Nighthawk X4S router. Recall that this is a previous winner of the crowded middle range market segment to win the best router award, and has pretty robust QoS settings. We decided to run the tests all wired with three foot CAT 5e cables. The game played was Medal of Honor: Pacific Theater at low settings, with FRAPS software to measure frame rates, and PingPlotter software to quantitate latency metrics. We also added in congestion via a second PC with five 1080p HD YouTube videos playing simultaneously. In this initial test, we achieved the highest 47 FPS with the gaming PC and the additional PC all connected to the router, without the switch in the circuit. There was also no difference in latency tests whether directly on the router, or connected to the switch. While the addition of the congestion did not significantly affect the latency or the FPS, there was no benefit of the Nighthawk S8000 switch that we could demonstrate. The highest FPS measured was when the gaming PC was connected directly to the router, which makes a compelling argument against the switch. There were also no latency spikes either with the switch or without so there was nothing to fix on these tests. Another interesting takeaway is the value of the wired connection that it can handle the congestion and still maintain stable FPS, which many Wi-Fi solutions choke on. Latency AVG = average latency expressed in milliseconds, and MIN = minimum latency, also in milliseconds. We next decided to ramp up the test. We chose a router that deliberately has no QoS, the Eero mesh kit. We also pushed up the settings on the game from low to high to increase the data requirement, and make the FPS more sensitive to the congestion. A limitation of most current mesh kits is they have a lone Ethernet port available for a client after the WAN connection to the modem, so we moved the congestion to the gaming client with four 1080p YouTube videos, and an additional 1080p video playing on an Android smartphone to simulate a busy household of devices with streaming video. The laptop was connected via the same Ethernet cable. In similar previous tests of this mesh router (as well as several others), with our network congestion test running, we achieved a mere 5 FPS when connected wirelessly, which hardly makes for a fun gaming experience, and is painfully s-l-o-w.
With a router lacking QoS, the benefit of the Nighthawk S8000 becomes apparent. In the FPS tests, with the congestion active, the FPS of 26.667 with the gaming PC wired to the gaming port of the switch improved upon the 23.767 FPS when directly connected to the router, or the 24.717 FPS when connected to a non-gaming port on the switch. While it was only a modest gain in the average FPS, the playability also benefited, as the minimum FPS also significantly improved as well. In fact the best result on the minimum FPS with congestion of 15 was achieved with the gaming PC connected to the gaming port of the switch. We took Netgear’s claim of latency improvement with the Nighthawk S8000 switch with more than some healthy skepticism, and it is notable that with all wired connections, there were no latency spikes on any of the configurations tested. However, looking at the average latency and minimum latency (both expressed in milliseconds in the chart above from Pingplotter), with the gaming PC connected to the switch, we were surprised to see lowest latency on both tests when connected to the gaming port. It was also surprising that the latency was lower via the gaming port of the switch than when directly connected to the router, so we can validate Netgear’s claim of low latency. The Netgear Nighthawk S8000 is a bit of a dichotomy, depending on the network and use case scenario. This switch certainly has gaming performance baked into its DNA. For those that already have a robust gaming router with QoS, than there will likely be no benefit of adding the Nighthawk S8000 to their already optimized network. 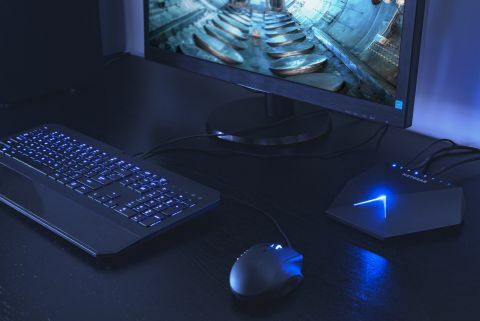 However, for the user that is on a mesh network for better Wi-Fi coverage, and sacrificed QoS, then the Nighthawk S8000 provides a way to add QoS and latency improvements back into the network for a wired gaming PC.